Thank you!! I'll ask him. If you want some info on fan expansions available for the new edition check this superb thread started by wolnic. So... how is thistournament going... All silence for a while now. And yes, cundco is the official german carcassonne online store. Hello pieceofyou and welcome to the forum also from me. Listen ... I understand you are a collector and you would be inclined to recover all the expansions of the game. in this case the advice I feel I can give you is to forget the old edition. There are many things of the old edition that are really hard to find and the prices are high. In addition, consider that all that will be done in the future will be for the new edition. Until now the only rare and difficult to find items of the new edition are the 5 promo cards and a scorekeeper. everything else is easy to find via cundco and other physical and online stores. Thank you all! I feel welcome and you've got great answers! And to add to that, the vineyards you refer to from big box 6 are gardens, those are for the Abbot expansion, that is only in the new art. It's a nice list! Thanks! Thanks Halfling for the very precise answers to my list of questions! I'm new to the Carcassonne community and it seems like you've got a pretty good overview. The game came out almost 20 years ago. Does it seem like there aren't coming many more expansions as you are unsure whether there will be an elleventh? As things are now, going for the old artwork doesn't seem too stupid, but it would be a bummer in the long run if many more expansions are coming in the (distant) furture. Is there a news portal for Carcasonne somewhere? Where do I find the latest news? Judging by what I've learned from you now, both artworks allows me to stacks up quite a few expansions. I get that this and this expansion are made in old and new art, but that's a different thing from actual availability. Do they still produce the expansions for the old art or does one have pay up big on eBay and alike to get a hold of them? I'm curious about both the big expansions as well as the small ones. If it's not that easy to get the old art expansions it will cause me more headache than fun going for that one. Is Cundco.de some kind of original store? Are there any other original stores for other countries or other sites you recommend buying from? Thank you for clarifying that your word "validated" was not meant to imply some kind of player community consensus, or an official answer. I think we can agree that the rules are poorly written. On the German forums, I found that they have additional questions about this expansion beyond the one we are discussing here. The second clause refers to 'the tree', not 'a tree'. I believe this means that the if clause applies to each tree on future turns. On the contrary, "the" tree implies that there is only one tree, or that only one tree is relevant; whereas "a" tree would be more in keeping with the concept of each. So even this argues more for concluding that they did not really intend for the active player to get up to 8 or 10 fruit actions all in the same turn. It takes too many turns to collect and sell fruit when you compare to scoring points traditionally; so combinations make the investment worthwhile. That may be true, but weak game mechanics are nothing new. Sometimes they are downright ridiculous, like the Wind Roses, and on the German forums, I saw the Fruit Trees being referred to as "a laugh" (after translation) more than serious gameplay. We already know that HiG puts only minimal rules effort into these mini-expansions, and the regulars on the German forums have confirmed that The Fruit Trees was not even allowed the usual proofreading by kettlefish or any other knowledgeable players. In any case, the strength/weakness of the mechanic does not change what the rules say (and don't say). The bottom line is that I can't find anything in the rules that suggests they intended for getting large numbers of fruit actions in the same turn. We would naturally (and reasonably) expect that if this were the case, they would simply have said "If any other fruit trees are adjacent to the meeple, you get one fruit action for each tree." But there's nothing of the kind. So let's see an example of how assuming unlimited fruit actions lets things get out of hand. Now Red places the Apple tree and, using his phantom, takes six fruit actions. If he spends them all grabbing fruit discs, that's an average of 21 points, compared to Blue's paltry average of 3.5 points for his Apricot disc. Of course Red will get a bunch more points when he sells the discs later, and he didn't even have to risk stranding his phantom. He gets it back immediately, since the road is completed. This will be quite easy to do in many cases, since the fruit trees tiles have so many easily-completed city and road elements (5 terminal city sections and 10 terminal road sections. If somebody comes along later and plugs the hole with another fruit tree (the Elderberry would do nicely) and his own Phantom, that player will then get eight fruit actions. I simply cannot imagine that HiG — if they were asked the question in a way that fully explained this potential — would say "yeah, sure, as many fruit actions as you like. That's what we were going for." I guess it's possible, but as a game designer I would be disappointed to see such a lopsided and undisciplined design approach. Then again, it is one of their throw-away mini-expansions, and they probably just don't really care. So I guess I should prepare for disappointment. As I said it was discussed, there was no tribunal. Mind you a lot of clarifications over the years have not been through tribunals either. I documented the games played on my write up last year. It wasn't my intention to seek formal clarifications while on holiday; though others were using the time to do this. 'When', which I believe corresponds to the eventuality of placing a meeple on a tree tile. 'If', which corresponds to a later turn, when you place a meeple on another tile. I think the 'one of the following action' is to limit you buying OR selling for each tree, not to limit each meeple. I think when you play a tree tile with a meeple on it, next to an existing tree; you meet both clauses. Thus, A player can take the one of the following actions twice. For example, it's already strategically beneficial for players to creates areas of landscape players are unable to finish; even though this doesn't seem like a good goal. Plays can choose to cluster some existing features, namely cloisters from the base game, to maximize their worth. It still requires players to place a meeple to invoke the actions; an expensive task. Could you place a wagon with the tile, perform a fruit tree action, score the wagon, then move the wagon to a different road/city segment on the same tile, then perform another fruit tree action (in the same turn)? What if the wagon was scored and moved (to either tile) on a later turn? 1. 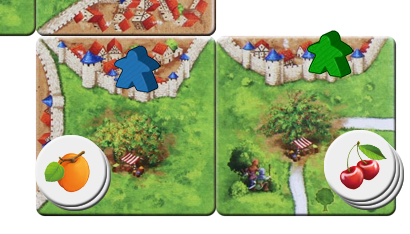 Can you perform another fruit tree action after moving the wagon to another feature on the same tile (in the same turn)? NO. The movement of the wagon happens in phase 3 of the turn (3. Score a feature), and the fruit action in phase 2 (2. Place a Meeple), so you cannot do it as you cannot go back in time and perform actions from earlier phases. 2. What if the wagon moved to a different tile adjacent to the fruit tree (in the same turn)? ii) You have to place a meeple on any feature on the newly placed tile. Therefore, in this case the turn sequence doesn't not allow you to trigger a fruit action again in the same turn. Moreover conditions (i) and (ii) are not met either as we are taliking about moving the wagon to a previously placed tile. 3. What if the wagon was scored and moved (to either tile) on a later turn? NO. The fruit action cannot be triggered in a later turn as the wagon is moved to a tile that was placed in a previous turn so conditions (i) and (ii) cannot be met either. Hope this clarified your questions. Thank you again for sharing. Great job!